Psychology says that colours have a profound impact on our thinking and mental capabilities. Colours can make us happy, they can make us angry and can even make us feel energetic or tranquil. And research shows that one who wakes up happier or goes to sleep happier is the one who is content in life. The build up of stress and fatigue throughout the day can lead to wear and tear and can drain us of energy. What would it be like if colours could come to the rescue of people to make them happy? And when we sleep and wake up in our bedrooms, why not have these colour therapies right beside your bed? Let’s sneak peek into some of the bedrooms across the world to see how they have adopted various colour combinations to play with their psychology and start the day with different feelings. There is nothing which looks more elegant than the combination of red and black. And when we drop the colour white into the palette, the trio look amazing. This picture shows a bedroom clad in red, black and white with two more colours, viz. Pink and blue, peeping from corners. 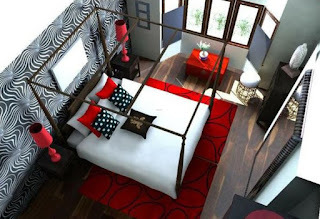 Have a carpet of red colour and rest the bed on it. The bed sheet must be white and the backdrop of the walls must be a texture of black. The red colour fills you with fire and energy and the white brings tranquility to your mind at the same time. This way, you become fiery by heart and peaceful at mind. Black signifies depth and seriousness and along with pink lampshades and blue pillow covers, the combination of five colours is sure to cast a spell on us. Gray is a colour between black and white. If black absorbs all energies, white reflects all of them. Grey takes the middle path and is a balanced form between two extremes. Having walls painted in grey with a shot of colour in bed sheets and curtains can lend a fantastical rendition to your bedroom. 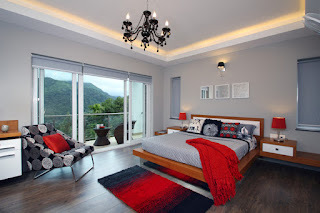 The combination of grey interiors along with red sheets and lamps and pale lighting will render a mystical feeling to your bedroom for sure. Notice how the light coloured walls have emerged out particularly, with the floor being dark. This way, even grey can be incorporated in the most private places of our home. 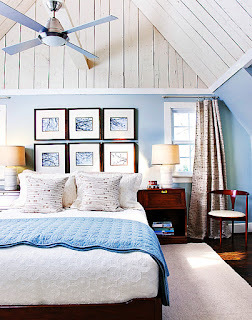 Why to have grey colour alone in the bedroom? Let’s add a drop of another colour in the palette to help colours pop out. Grey and pink can together become a classic combination. It can be a perfect colour combination for the bedroom of your kids as pink stands for affection and motherly care and grey is again symbolic of balanced mind. Choose an appropriate tone and sheen of pink that gels along with grey. Having very bright shades of pink can make the bedroom look jazzy which may steal away the essence of bedroom. 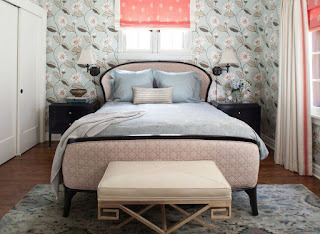 The duo of pink and grey gives a vintage look to the bedroom. These days, we can even get hold of tiles, laminates and wallpapers that have grey and pink as major colours. Orange is the colour of liveliness, sacrifice and creativity. When added to pink, it makes the combination look like having come directly from land of fantasy. The combination of orange and bright pink can make your bedroom look quite chic and warm at the same time. Please note that the tone of pink has to be bright. Dull shades of pink won’t work here. The curtains, bed sheets, walls and pillow covers can also be dressed in these colours to make your bedroom look like a world of fantasy. Notice in the picture how two photo frames have been displayed at the back of the bed, which accentuate the pink and orange colours in the bedroom’s theme. You must have by now guessed the colour already. Green is the colour that takes us back to nature. Having walls painted in forest green colour and having furniture in earthy brown colour can indeed take us back to the nature’s lap and give us a feeling of being in a forest. This colour combination works wonders for the mind and the soul and is associated with bringing peace and stability to the mind. The depth of the colours strikes our mind directly to create a profound impact and the room looks quite inviting through these colours. Try this combination to make your room look livelier than ever. Blue is known for signifying serenity, traditional outlook and peaceful. When combined with colour of harmony, i.e. white, it creates a clear, fresh and scrubbed combo. The colours can make the room look more inviting than ever and portray you as down to earth. When combined with other earthy colours like wooden brown, or earthy brown, the bedroom is bound to look quite down-home and soothing. Look at the picture below as it shows how the photo frames add to the elegance of our room and how the windows illuminate the room with sun rays peeping into the room. The smooth finishing of wooden articles make the room look royal. Let’s go back to green but with a different shade and tone this time. The walls are painted in green signifying fertility and prosperity. The back of the bed is coloured in baby pink colour. 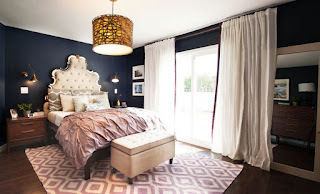 Notice how the pillow covers along with the lamp shades accentuate the pretty colour combination in the bedroom. 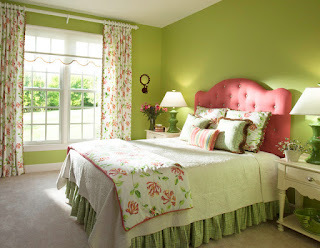 The white bed sheet compliments the green-pink duo and the flowers in the vases add an even more natural touch to the bedroom. Purple was considered to be a royal colour in many ancient kingdoms and the same outlook can be created in bedrooms too by having walls painted in bright purple and having bed linen in lighter shades of purple. Don’t forget to add photo frames that display a lot of purple colour to emphasise the importance of purple as a vital element in your room. The shades of blue and green look visually soothing. 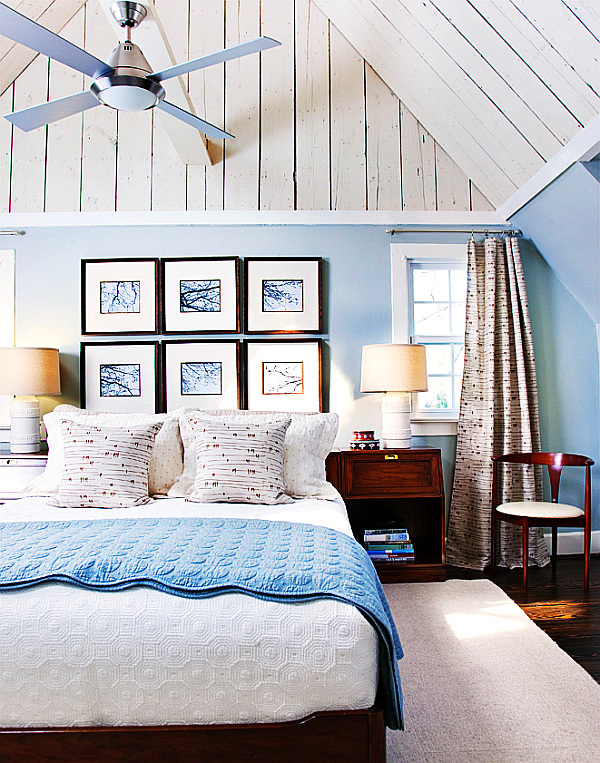 Along with creamy whites and pale aqua shades, this colour combination makes the room look quite earthy. 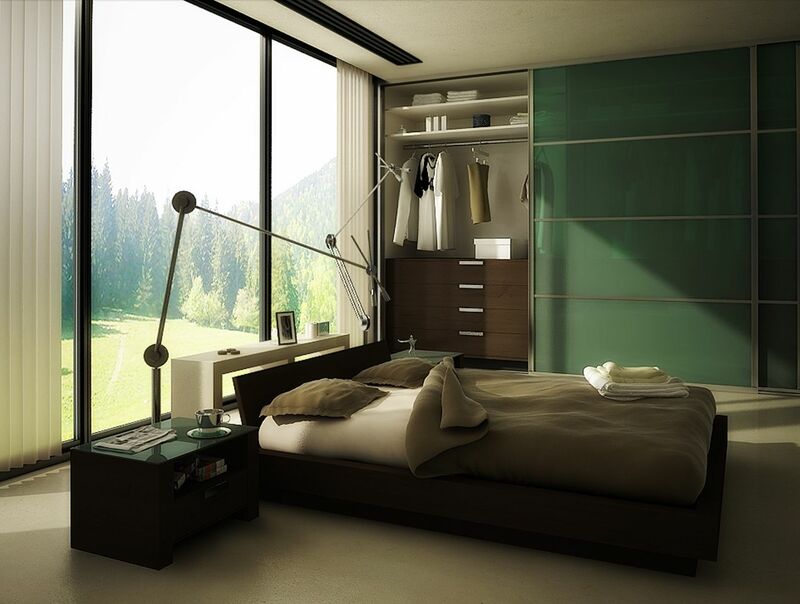 Serenity is required as a vital element in the bedrooms and this colour combination ensures that it is taken care of. Add a tinge of sophistication and youth to your bedroom with the drops of lavender on the walls. 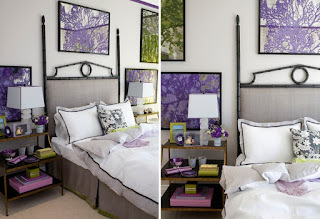 Having walls in colour of lavender and bed sheets of light lavender can make the bedroom look majestic. Notice how the design of the bed looks regal and lighting arrangements make the bedroom look so aristocratic. It is time to get a good sleep tonight. And if you want to make the experience of sleep the best in your life, then now you know how to renovate your bedroom. Go ahead! Happy sleeping!